One trick tactic that a lot of new (and possibly some older) players are unaware of is how you can counter an unfortunate "Waver" from Melee. This only works if you are "Nimble" but is worth knowing. It may save an important character or unit AND allow you to damage the enemy in return. "Nimble" allows you to make a single extra pivot of up to 90 degrees while executing any Move order. The diagram below shows how you can combine the attributes of these rules to move yourself out of danger and attack an enemy. The Pink unit has been Wavered in Melee by the Green Unit (1). It is now in a vulnerable position while also shielding the front facing of the victorious Green unit. This makes it impossible for the Green unit to be charged from its front arc. 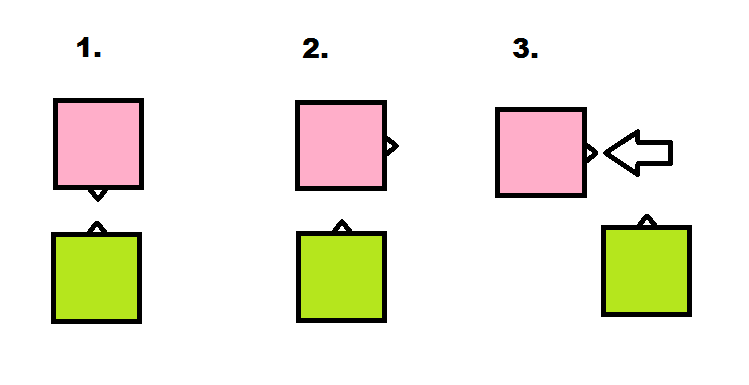 If the Pink unit is Nimble, it may change its facing before it moves (2). Here it rotates 90 degrees - remember it must stay outside 1" from the Green unit so it must be no wider than it is deep. 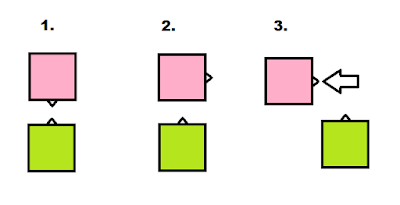 The Pink unit can now make a move backwards at half its normal speed (3). If its Move characteristic is very high, it may get out of the Green unit's front arc. However this is very unlikely. What it does do though is open up the front facing of the Green unit allowing another unit from Pink to Charge it. Remember you must have the "Nimble" rule, so if you are using the COK rules it will no longer work for Flyers as they are automatically "Disordered".